Available in pine, hemlock, oak, ash and dark red hardwood, our Stairparts collection is one of the most complete lines of stocked stairparts on the market. 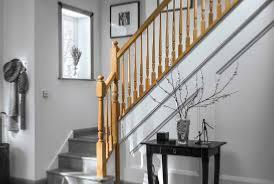 Comprising graceful, well-proportioned profiles in a variety of designs, and with a comprehensive range of handrail. Available in pine, hemlock, oak, ash and dark red hardwood, our Stairparts collection is one of the most complete lines of stocked stairparts on the market. Comprising graceful, well-proportioned profiles in a variety of designs, and with a comprehensive range of handrail.We have an exquisite range of contemporary stair parts. We’ve comprised a collection of six exquisite designs that marry the organic, natural beauty of wood to stunning hardware components in chrome, brushed nickel and glass. These incredible blends create individual and unique staircases that become the focal point of any living space.